This is my favorite time of the year. The weather gets cooler, the leaves start to turn beautiful colors and stews and chili start filling my kitchen with delicious smells. I love stew. There is something so comforting and warming about a great stew. It can transform a bad day into something bearable. I use my crockpot extensively during the cooler months, but there are some stews which just taste and smell better when done on the stove. There are few things better than the smell of stew on the stove. It's very warm and inviting. My favorite meat to make stew with is lamb. When cooked correctly, lamb is a great meat in a variety of recipes. 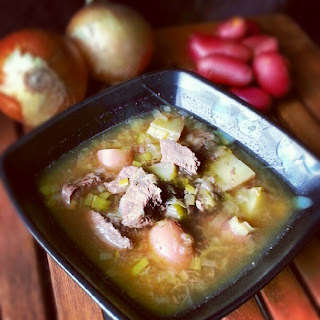 Recently I tried a new recipe for Lamb, Potato and Leek Stew from Everyday Food, which looked easy and perfect for the cooler weather to come. This recipe has 7 ingredients. It takes a total of 1 1/2 hours, 15 minutes of which is prep and makes 4 servings. I had no problems finding any of the ingredients and made no ingredient modifications. I chose not to top the stew with parsley. The parsley at my local store was mediocre, and my kids pretty much hate it, so I chose to leave it out. Make sure to adequately salt the stew. Without adequate salting the stew will lack flavor and be bland. After salting the flavor was perfect. I followed the remainder of the recipe as written. I love stew made with lamb and this recipe was great comfort food. The lamb was tender without being over cooked. If your looking for a stew with a variety of spices, this isn't the recipe your looking for. The flavor of the stew comes from the lamb, which is delicious if cooked correctly, After salting this stew was perfect comfort food and even my two boys enjoyed it. For the recipe go to Lamb, Potato and Leek Stew.